If you work in building services or construction there is a very high chance that at some point, you will come into contact with asbestos. If you are an employer, you must make sure that anyone who is liable to disturb asbestos during their normal work, or who supervises those employees, gets the correct level of information, instruction and training. This is so that they can work safely and competently without risk to themselves or others. 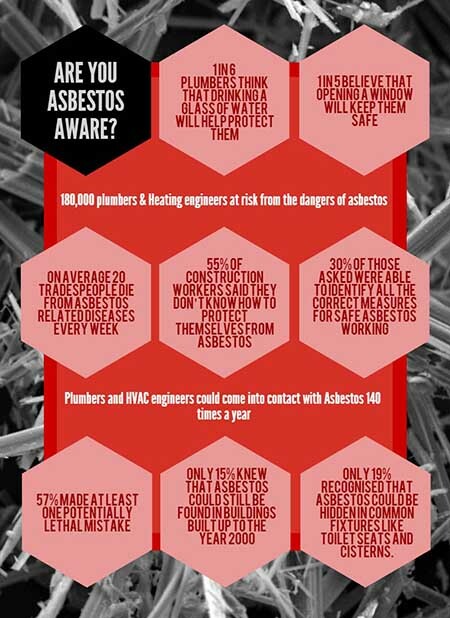 Asbestos kills around 20 tradespeople every week. It is still a huge danger to professionals, and the public. Because of this, some work may require a licensed contractor, some may have to be notified (scroll down for more information on this). Information, instruction and training needs differ depending on your role and the type of work being carried out. We have tried to cover the most common in this blog but if you would like to find out more you can visit HSE for more detail. Who needs to be asbestos aware? If your business is liable to come into contact with or disturb asbestos then workers and supervisors must be able to recognise asbestos-containing materials (ACMs). Workers and supervisors must also know what to do if they do come across them in order to protect themselves and others. Workers and supervisors must develop their competence over time by taking what they have learnt in training and applying it on-the-job. Make sure the level of information, instruction and training is appropriate for the work and roles undertaken by each worker (and supervisor). There is no legal requirement for employees to hold a certificate of training before they can work with asbestos, however many training providers will issue trainees with certificates. A certificate is not proof of competency to do the job but it does show that you have had the training and can be kept as part of your personal training record. What should asbestos awareness training cover? Online or “E-learning” is a popular method of providing asbestos awareness training. It is recognised by the HSE as a viable delivery method provided it satisfies the requirements of Regulation 10 of the control of Asbestos Regulations 2012 and the supporting Approved Code of Practice L143 “Managing and working with asbestos”. Workers who plan to carry out work that will disturb asbestos will need more advanced training and a greater level of understanding. This should take account of whether the work is non-licensed; notifiable non-licensed work (NNLW); or licensed work and should be job specific. It is your own responsibility to make sure you have the right level of information, instruction and training. You may not prioritise asbestos awareness if you are a one man band but it is vital you get the right training so you are not putting yourself or others at risk. You may require this information if your profession is listed in the “who needs asbestos awareness” list above. This list is taken from the HSE website but it is not a complete list. Information, instruction and training should be appropriate to the work being done and should be tailored accordingly. Most work with higher risk asbestos-containing materials must be carried out by licensed contractors. Any information, instruction and training on asbestos awareness is meant to help workers avoid carrying out work that will disturb asbestos. You do not have to repeat entire awareness training every 12 or so months but some refresher training should be given. Workers and supervisors need to make sure their knowledge of asbestos awareness is maintained. E-learning is preferable for refresher awareness and can be delivered as part of a general health and safety update (eg, it could be delivered as a safety talk to employees). Using judgement based on individuals abilities and training needs should be all that is required. There should be an appropriate level of practical training, particularly covering decontamination procedures, use of RPE, FFT and controlled removal techniques. There is so much to cover when it comes to asbestos. There is a vast amount of information available on the HSE website. We would recommend the Frequently Asked Questions page as there are all sorts of answers with regards to regulation, policy and the trades.